Many things can affect our mood, but when you want to calm down, smell, sound, and what you see can play major roles in that situation. When we’re trying to have a relaxing evening, we normally try to put on calming music, dim the lights, and light scented candles. It doesn’t always work, but why not give it a shot, right? 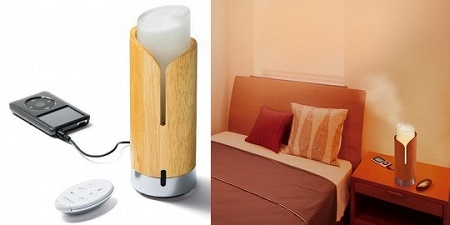 If you prefer to save your candles for the winter when you need heat, or often use your phone as a speaker, then you may like the Akari Speaker Aroma Diffuser. Simply drop some essential oils into the diffuser, and a fragrant mist will let loose. You can hook up your own music player, or listen to one of the five soundtracks that are built-in. The light can be adjusted to yellow, green, orange, pink, purple, or blue. All of this can be controlled via remote, which makes it a very stress-free setup. You can set the diffuser on hour or two-hour increments, so you don’t have to worry about it trying to run for hours. It can hold 2.2 fluid ounces, and will need to plug into the wall. The casing can come in either a natural or brown wood. While relaxation is extremely important to living a happy and healthy life, this may be a bit over-priced at $151. It will certainly give you the atmosphere to relax, but chances are that you already have all the necessary tools to put yourself into a calming environment.